Vinatha M. Reddy is one of the early activists and pioneer in micro-finance sector in India. She is the Founder and Chairman of Grameen Financial Services Private Limited. She is a graduate in Arts. She was from a very comfortable background, but she could always empathize with the people who were under-privileged. She has been engaged in the field of development, even before her involvement in micro finance sector. She was running a rural-based Montessori school called “Gurukul” in her native Avalahalli village which she started from the trust set up by her grandmother. Gurukul is serving till date amidst the natural lush green & serene atmosphere. GrameenKoota was founded by Mrs. Vinatha in 1999. Her journey from Gurukul to Grameen is an intriguing one. In India micro finance was not known to many in those times. She came across the theory of micro-finance by reading the book “Give Us Credit” by Alex Counts. “Give Us Credit” is a story of Grameen Bank, Bangladesh and Prof. Yunus, Chairman of Grameen Financial Services Private Limited. The narration how micro finance gave hopes and up-lifted the poor in Bangladesh attracted her towards the concept. She saw micro-finance as a powerful tool to raise people out of poverty in India. She immediately wrote to the author asking for more information on the concept. She waited months, for a reply. Little did she know, the letter was being forwarded by Alex Count directly to Professor Muhammad Yunus. She got a call from Prof. Yunus inviting her to join his training program. Following which she submitted a project proposal, which immediately got approved as she was already running a NGO started by her grandmother. She received a grant of 35000 US dollars from Grameen Foundation to set up Grameen replica in India. Thus GrameenKoota was founded. By her sheer will and determination she has nurtured GrameenKoota from a project under a not-for-profit entity into a division of Grameen Financial Services Pvt Ltd (GFSPL), a NBFC MFI. Currently, GrameenKoota is spread across 3 states with 200 & more branches. Apart from lending GrameenKoota is also involved in various social development activities like health care campaigns, sanitation & financial literacy programs. In the exclusive interview Vinatha, shares her thoughts on how she came across micro finance, current status of Indian micro finance sector and much more. Nithya: Why & what made you to choose Micro-finance as your career? Vinatha: I never chose micro finance as a career. I stumbled upon it! I have had a comfortable upbringing and spent a lot of time in this village of Avalahalli in my grandmother’s house. All around our house lived the poor of Avalahalli Agricultural labourers, quarry workers, daily wage earners and others. The memory of having seen their poverty, their stark lives and especially the condition of the children of these underprivileged homes, was always there with me. A chance reading of Alex Counts book, “Give us credit” on the story of Prof. Yunus and his work with the poor, convinced me that I needed to replicate the same work to help the poor households of Avalahalli. That is how GrameenKoota was born in Avalahalli in 1999. Nithya: What were the difficulties & constraints you have faced in your career? Vinatha: We have been lucky that GrameenKoota has had a good run and track record. As we replicated the tried and tested Grameen Bank program, we were able to build a strong foundation for GrameenKoota. From the beginning we had the advantage of Prof. David Gibbon’s Grameen manuals which were a source of excellent guidance. The challenges we have constantly faced is about raising debt funds from Banks. Most of the Bankers were familiar only with SHG-Bank linkage and were apprehensive about lending to MFI’s. We had to work hard to remedy this situation. The aftermath of the two crises as in Andhra Pradesh were also challenging times for us. Nithya: Indian micro finance sector has seen various ups and downs. There have been talks that MFIs have deviated from their sole purpose. As one of the veteran in MFI sector, what do you stand for & what are the policies you are against? 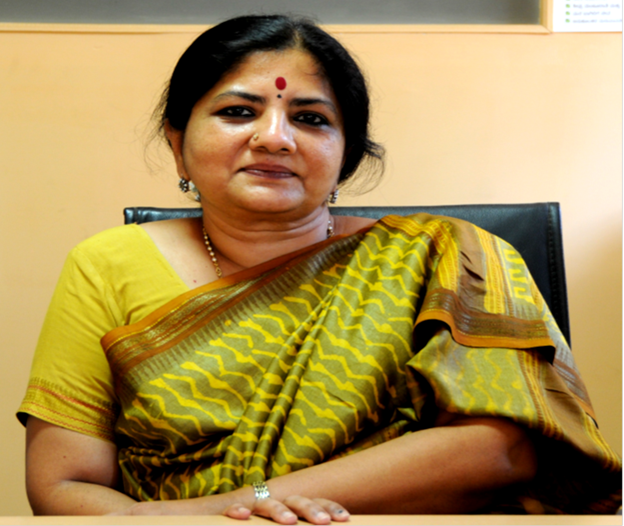 Vinatha: I believe that micro finance has to be run strictly in a business-like manner but with a firm social purpose. There should be no compromise in either of the two objectives. The client should always be the centre of our focus. The micro finance sector needs to adhere to the code of conduct principles that have been issued which will lead to fair practices and client protection. We need to be constantly conscious of the quality of our service as we deal with an asset class of vulnerable and semi-literate clients. We should always aim for controlled growth with no dilution in good practices. Nithya: MFI sector is still working on traditional business practices like door to door business model, cash collection etc., Are we changing as fast as the world around us? Is it not the high time, we start focusing more towards customer empowerment & investment in technology? Vinatha: Innovation and reforms are the need of the hour in micro finance. The next version of micro finance is overdue. We have to innovate and evolve to provide easy services to the clients. Many current practices can be dismantled and customers should experience ease of transactions and technology interventions too. Nithya: In a country like India, where there is huge disparity between rich & poor. Don’t you think government/RBI should step in to provide loans to MFIs at much subsidized rates? Vinatha: The people that the micro finance sector is servicing, the asset class of our clients who are from low income households and the unorganized sectors are the direct responsibility of the Government. So it is but logical that the Government/RBI should step in to provide debt funds to MFI’s at lower rates of interest. Compared to the huge NPA’s the Banking Industry is facing, the repayment track record of the MFI sector should also warrant a better credit score for this sector and lowering of interest rates. Nithya: Investors, who generally expects higher returns for their investments may not be the best source of funding for social business models like Micro-finance? What is your opinion on that? Vinatha: Firstly, social businesses like Micro Finance need to be scaled up to enable total financial inclusion. For this to happen, the sector needs huge amounts of risk capital which only investors can provide. The good news is that the days of runaway profits are over. With the maturing of the sector, with new Micro Finance regulations in place, with close monitoring by RBI, with the credit bureau in place, with an industry watchdog functioning and competing, it is not easy for MFI’s to develop bad habits of pursuing unbridled profits. Nithya: Major focus of micro finance sector is financial inclusion. But for the most part MFIs stops with just giving credit. What should be done to include other services like Savings, Insurance, pension schemes as well? Vinatha: Credit is only a part of financial services and financial inclusion is incomplete without savings, insurance and pension. Likewise the bedrock of financial literacy campaigns is savings, which MFI’s cannot provide presently. So currently our financial inclusions efforts are incomplete and our financial literacy campaigns are meaningless. We have to work hard to remedy this situation. We have to engage with the Regulator for change in rules to enable holistic financial inclusion. Nithya: Banking license or small banks or any other option? What is the way forward for Micro finance industry? Vinatha: The way forward for the micro finance industry is definitely small banks. Banking licenses would be out of reach and not viable for MFI’s. Small banks format is most suitable for MFI’s. I think the sector is eagerly awaiting the announcement of the norms and guidelines from RBI for small banks. Provision of complete range of financial services by small banks will take the sector into a different orbit altogether. Our clients would then experience true customer empowerment with all their entitlements like credit, pension, insurance and most importantly “savings” in place. Nithya: What you consider as the best learning in your career that you wish to pass on to aspiring women entrepreneurs and youngsters in general? Vinatha: Firstly, there is no ceiling for entrepreneurs whether women or men. What matters is passion, commitment, consistency and doing the right things at all times. Success depends on these factors and women should believe that gender plays no part. The younger generation today more than at any other time in history is, equipped with education, awareness and technology to bring about positive transformation and changes in the world. They should have faith and confidence in this power they possess. Those of them who have had a comfortable upbringing and a good education should do whatever is in their power, to lend a helping hand to bring about change and to build a more inclusive world. I first met Vinatha in 2004 when I visited Grameen Koota’s to explore the possibility of learning about microfinance. 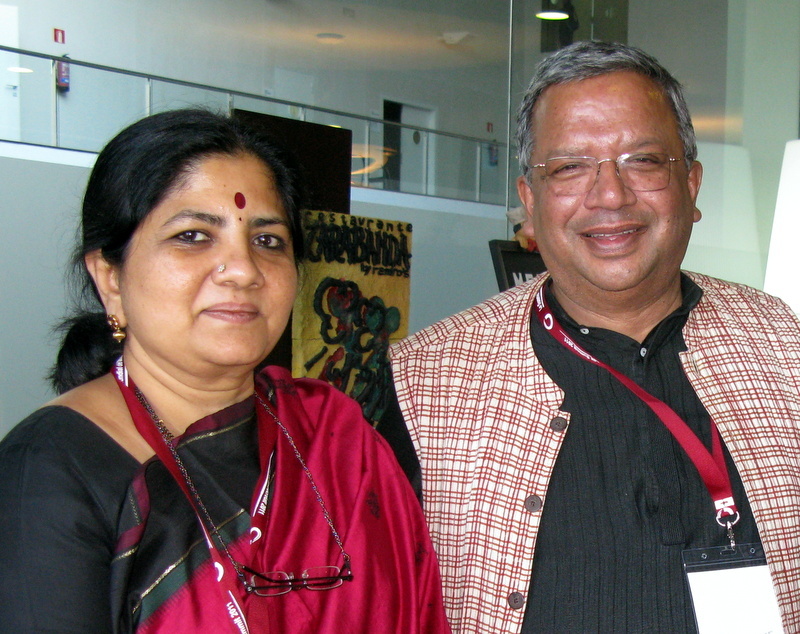 Suresh Krishna & Vinatha who meet me that day, looked me up & down with lot of curiosity. What was this veteran banker up to? In those days bankers rarely ventured into microfinance. Over the last decade, we worked together to establish AKMI (Association of Karnataka Microfinance Institutions) which is a model for the rest of the country. We learnt to collaborate both in good & bad times. Grameen Koota & Ujjivan compete but also work together when required. Vinatha’s story of induction to microfinance never ceases to amaze me. Here was a lady from an affluent family running a Montessori school in the outskirts of Bangalore. She reads a book: ‘Give me Credit’ and gets inspired. A few months later she lands up at Grameen Bank in Bangladesh and rest is history. To me this a hallmark of a great leader, amazing courage & curiosity and motivation to serve the downtrodden. Ten years down the road from the day we first met, we are good friends and colleagues in the industry. I enjoy & am privileged to be in her company in any part of the world. She represents to me the epitome of the pioneers who built the microfinance industry & remain true to its altruistic ideals.